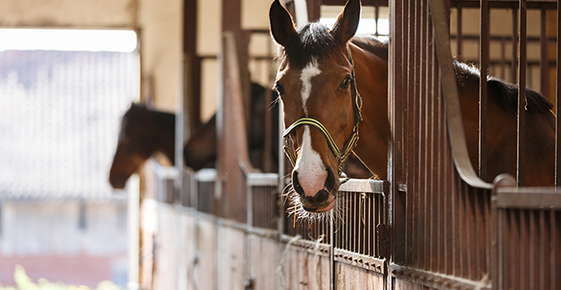 How often do you clean your horses’ stalls? Ideally, horse stalls should be cleaned every day and kept as clean as possible. Since horses often lie down in their stalls at night, this behavior means that if you are not keeping the stalls clean, horses could be lying in their own urine or manure – and there’s nothing healthy about that! Cleaning stalls is often considered to be a menial or unimportant horse-keeping chore. In reality, this chore is incredibly important as a dirty or improperly mucked stall can lead to a host of health problems in the horse, including thrush, cellulitis, breathing problems and skin problems. Horses lying in their own manure or urine-soaked bedding is detrimental to your horses’ health for several reasons. First, ammonia fumes from urine can irritate a horse’s sensitive lungs. Secondly, horse hooves that are continually exposed to wet bedding in their stalls are at increased risk for developing the bacterial infection thrush. This painful condition occurs when bacteria accumulates in the softened sole due to prolonged moisture, which can be difficult and unpleasant to treat. Additionally, horses that lie down on wet or dirty bedding may develop a variety of different skin irritations, not to mention requiring extra grooming to clean off all that manure! While clean stalls are important for all horses, it becomes increasingly critical for horses that do not have extended outdoor access. For example, stalls must be cleaned consistently throughout the day for racetrack horses that are confined to their stalls for 22 to 23 hours a day. The first step to a good stall cleaning is to sift through the manure with a cleaning fork. Get to know your horse’s habits: some have a regular routine and will defecate in the same spot every day, while other horses will spread their manure all over the stall. Fillies and mares typically urinate in the back of the stall; colts and geldlings urinate in the center. Remove all the urine soaked shavings to reduce the risk for thrush and unhealthy ammonia vapor levels. Rake to remove as much urine-soaked shavings as possible. Evenly spread clean straw and bedding as needed. Remember, it is better to have too much bedding, straw and shavings than to not have enough. Failing to use sufficient bedding increases the risk for hock sores, foot ankle abrasions, and urine stains on your horses. When cleaning the stall, be sure to clean out the feed tubs and water buckets, too! Raymond, Toby. “Keeping Barns Clean.” The Horse, 2006.